VATICAN CITY Pope Benedict XVI's general prayer intention for August is: "That all those who are going through moments of inner difficulty and trial may find in Christ the light and support which leads them to discover authentic happiness." His mission intention is: "That the Church in China may bear witness to ever greater inner cohesion and may manifest her effective and visible communion with Peter's Successor." Since Sunday I have had 6,000 visitors sent by Spirit Daily, they are all visiting the post I put up then, on the Sacrament of Annointing. I suppose though this is an indication of the tremendous number of readers American sites have, normally I get 225 and 300 visitors a day, which for an English blog isn't bad. My thanks too to those who come back to the blog time and time again, and to other bloggers who link to Saint Mary Magdalen, and occassionally tip hats, mantillas, birettas or saturni to this one. On the "Ceremonies of Bishops"
Archbishop Raymond Burke on visitation, prays before the Blessed Sacrament, he wears the Cappa Magna, an option on the most solemn feast within his diocese (see Ceremonial of Bishops no. 1200) The ferioula of the assistant should be stuff NOT silk by the way. A friend asked me to look up what should happen when his bishop visits his Church. The bishop has never been there in all his four years in office. According to the Ceremonial of Bishops, published in 1989, he should be dressed in a choir dress (the purple cassock) and rochet, and what a friend of mine calls, the little pink hat, and wear a pectoral cross on a green and gold cord. The book says, “A dignified solemnity in receiving the bishop is a sign of love and devotion of the faithful toward their good shepherd.” 1179. I am not sure that I have seen this happen in a Catholic Church, but it is very clearly in the rubrics. Recently both bishops and priests have been reminded, by the Pope and Cardinal Arinze, that they should neither add nor subtract anything from the liturgy. Some bishops never wear, and one suspects, don’t even own choir dress. Some seem unaware that there is a book entitled, “Ceremonies of Bishops”, it would be uncharitable to think they merely disregard it. It is full of useful stuff, for example, it contains the instruction about the bishops (and others) hands being joined,“he keeps his joined”, 107 says, then there is a foot note “Hands joined” means: “Holding the palms sideward and before the breast, with the right thumb crossed over the left””!!! I hope fidelity to the rubrics of both usages might be a fruit of Pope's Motu Proprio, the Pope has spoken of a forthcoming Compendium of the Liturgy, so presumably all that one needs to know will be in one book, and reasonaly clear. Today is the feast of St Ignatius of Loyola, the founder of the Society of Jesus. St Ignatius taught his followers to pray in a way that brought them into contact with the person of Jesus. It was this personal relationship with Jesus that caused his followers to live their faith on a grand scale, like Francis Xavier going to the east to convert hundreds of thousands, men or Edmund Campion and Ralph Sherwin and many others who died for the faith in England and elsewhere. The contribution of the Society of Jesus to post reformation European and American culture is immense especially in their contribution to the sciences and to education. The recent Chinese exhibition at the Royal Academy showed the influence that a small group of these extra-ordinary men had on that society. The unique fourth vow of the Society, of obedience to Holy Father, meant that they were the Church's shock troops. For the most part all seemed well until the 20th century, when the Jesuits rather than leading men and women deeper into communion with the Church led them further and further away. Today "Jesuit" is synonymous with disobedience, rebellion, even heresy. The order that once proclaimed devotion to the Sacred Heart and to the Spiritual Exercises is more likely to be using the enneagram, or putting on “pray with clay days”. Therapy seems to have replaced Spiritual Direction. The art of reading scripture according to the mind of the Church has been replaced by reading it according to the mind of 19th century philosophers like Marx or Engels. Those who led non-Christians to Christ are more likely to be themselves taking on the spirituality of the ashram. Once Orthodox bishops welcomed them into them dioceses, now they seek to get rid of them. Once their schools had a reputation for excellence and producing leaders of society, now if they are not embroiled in cases of sexual abuse, their products lapse and turn against the Church, with little notion of the teaching of that Church they reject. Hindu dancing Jesuits, Jesuits who promote lifestyles which in the past would be considered sinful, Jesuits making up their own liturgies, Jesuits taking part in non-Christian worship, in public disagreement with the Pope all remind us of the importance of praying for the poor things. Martini: I won't do it! A leading liberal cardinal in the Catholic Church says he will not celebrate mass in Latin, criticising Pope Benedict XVI's decision to allow for greater use of the old Latin mass. "A bishop cannot ask his priests to satisfy all individual demands," he said in an article published by Il Sole 24 Ore newspaper. A papal decree earlier this month said priests should now meet requests by the faithful to hold mass in the traditional Church language, which had widely been dropped after the Second Vatican Council in the 1960s. Cardinal Martini has broken his silence on numerous occasions to counter Vatican positions on social issues including assisted procreation, the use of condoms and euthanasia. The renowned scripture scholar, who suffers from Parkinson's Disease, stepped down as archbishop of Milan in 2000. In some quarters he was tipped to succeed Pope John Paul II. Vatican II is of course is very much the issue, but as far as the Mass is concerned the Fathers of the Council all understood that the Mass they celebrated before and immediately after the Council would continue to be celebrated, possibly with the Scriptures and other small parts of the Mass in the vernacular. What Martini is objecting to is the scraping a way of post Council nonsense by the Holy Father, it isn't a repudiation of the Council but a real discovery of it. In an email from a friend in Rome today, he said that one of the questions that nuncios will ask concerning future bishops, is their friendliness towards the Johannine Mass; as a touchstone demonstrating their ability to accept the larger Tradition of the Church. H/t to American Papist for this set of videos made my American Seminarians. common prayer of praise to God.The Pope could celebrate publicly Mass in Latin according to the Rite of St. Pius V. An official introduction of the Rite which, as far as ADNKRONOS has learned from authoritative Vatican sources, could take place on the 1st Sunday of Advent, the beginning of the liturgical year. Rumours abound in Rome that the Holy Father celebrates Mass according to the Traditional Rite when there is just his household present. However when a couple of acquaintances of mine attended his Mass on the morning before their wedding, it was in the Pauline usage. Before becoming Pope he happily offered Mass in both forms. The picture shows him celebrating an ordination in the old rite at the Seminary of the Society of St Peter at Wigratzbad in Germany. There is a fascinating article Fr Benedict Groeschel here on the Life and Death of Religious Life, it was first printed in First Things. He belongs to one of those new thriving religious communities, the lean, hairy, ascetic Franciscan Friars of the Renewal. Marking the 50 anniversary of the IAEA, Benedict XVI expresses his support for its aims: discourage nuclear proliferation, promote disarmament and the peaceful use of atomic energy for progress. Appeal for the release of the Korean hostages in Afghanistan. Castel Gandolfo (AsiaNews) – An end to nuclear proliferation, the promotion of nuclear disarmament and the peaceful use of atomic energy for economic progress, above all in favour of the poorest. These are the aims of the International Atomic Energy Agency, whose 50th anniversary was marked today by the Pope, when he underlined the fact that the Holy See is part of the UN organisation and shares in its objectives. Benedict XVI arrived in Castel Gandolfo following his period of rest in Lorenzago di Cadore, Northern Italy. During his first Angelus in from the Papal summer residence he appealed for the release of the 22 South Korean hostages kidnapped in Afghanistan. In a short appeal launched after the recitation of the Marian prayer, the Pope neither named the hostage nor the Taliban kidnappers. “The exploitation of innocent people as a means to gaining partisan ends – noted the Pope – is becoming more widespread among armed groups. This – he continued – is a grave violation of human dignity, in stark opposition to every basic norm of a civilised society which also gravely offends divine law. I urge the authors of these criminal acts to desist from the evil they are doing and to release their victims safe and intact”. Before the Angelus, Benedict XVI had reminded the faithful gathered in the courtyard of the Apostolic Palace of Castel Gandolfo, that in last Sunday’s Angelus he had re-evoked Benedict XV’s words against the “senseless slaughter” of the First World War. “Last Sunday – he said – recalling the “Nota” of August 1st 90years ago addressed by Pope Benedict XV to the warring countries of the First World War, I dwelt on the theme of peace”. “It hasn’t worked, Father”, said my early morning telephone caller. Yesterday, I had given her the Sacrament of the Sick, apparently she hadn’t been cured, and therefore it hadn’t worked. Another member of my parish who is quite sick, disabled, in a wheelchair rings me whenever she is feeling particularly ill or depressed and wants, “The Anointing”, it makes her better, for her it always “works”. At the moment our diocese is in Lourdes, one of the highpoints is the Celebration of the Sacrament of the Sick, I am not too sure what happens nowadays, but in the past practically everyone was anointed, the sick and as well as many of the able bodied pilgrims and many of the helpers. The music tended to create an atmosphere where tears flowed and emotions were high. In the past, the sacrament was called “Extreme Unction” and was given only when there was a pretty obvious connection with death, to the point where it was often referred to as the “Last Rites”, Catholics felt it very important that the priest should be called to administer this sacrament, before death, in those days death was defined as before decomposition set in. it meant that prison chaplains would anoint the bodies of prisoners who had been hanged, after execution had taken place, rather than before. The significant purpose of the sacrament was to heal the soul, although many Catholics had stories about people who were sick that the priest was called, the sacrament given, and a sick person recovering. At one time it was given only once in a lifetime. Now, one gets the impression that the sacrament only works if, there is a recovery or at least someone is expected to feel better, salvation is not an issue, and the results are expected, now. Then salvation has ceased to be the issue with the sacraments in most people's minds except in the most remote way, they have become about us, in the past they were always about God, and our eternal relationship with Him. What an odd situation we have got into. Hallowed Ground always has the most glorious archival photographs, for some reason I always have difficulty downloading it, but it is worth it. Now, we have water in Brighton, is there a pious ship builder who might help with a little project for a Thursday after Trinity Sunday next year? While it was once thought that the mitres used by bishops were directly descended from the somewhat-similar hats used by Jewish high priests, it seems that mitres are rather descended from Greek athletic headgear. The oldest part of the mitre, in fact, is the infulae--the two bands of fabric which hang from the back of the hat itself. These two bands were originally a single handband, which Greek athletes wrapped around the forehead and tied in back, creating the two bands which mitres have today. In the summer, a cap was placed over the infulae, giving rise to the mitros as such. Both the Catholic Encyclopedia and the Church Visible cite the tenth century as the first recorded use of the mitre by bishops. The Church Visible specifically states, "During the earliest centuries of the Christian era, no mention is made of anything that resembles the present mitre." Instead, the mitre "appeared lost to history," with no continuous chronological connection between the Greek athlete's mitres and the ecclesastical mitres. Here is my question, however: it seems to me that the ecclesastical mitros would be directly linked to the athletic mitros by virtue of the infulae, because they are a vestige that would probably not have been specifically added. Put another way, if bishops just decided to start wearing a cap and gave it the name mitros, it seems less probable that they would have thought to include vestigal infulae, if they had even know that a proper mitros had such things at all. Further, Eusebius of Caesarea (AD 275-339) quotes a letter from Polycarp saying the following: "There is also John, who leaned on the Lord's breast and who became a priest wearing the miter, a martyr, and a teacher." The reference by Polycarp of John wearing the mitre is probably an anachronistic interpolation; but even if we assume this letter which Eusebius quotes is a forgery, this gives us a 4th century reference to episcopal mitres, which, combined with matter of the infulae, suggests to me that the use of the ecclesiastical use of mitres is older than the tenth century. So why, then, does the scholarly concensus hold a tenth century date for the origin of ecclesastical mitres? I don't have Eusebius' Greek original, so perhaps he doesn't use the word mitros and the translator added the word "mitre" anachronistically. Or maybe there's some other reason? Does anyone know? I find this interesting, it is the retention of the infulae that is significant. I wonder if there is a connection with the cloth that is bound around the bishops head after Chrismation in the Johannine Usage. In the modern usage the bishop is annointed on the place where formerly he would be tonsured and the skull cap is immediately place on his head. Formerly he was annointed on the forehead and and a linen bandage was tied round the head, which was retained for several days after ordination. Recently, I heard that "Diversity" is now part of the curriculum at Hendon Police College. Apparently a group of trainees were told by someone who advises the Met Commissioner on such issues, that Christians basically are always against homosexuals, and the Catholic Church is "the", as in number one, "enemy of gay men and women". When I discussed this with a journalist, I was told that following a government directive to recruit from the homosexual community, in one English Police Force 16% of new officers identify themselves as gay or lesbian, that is going to rise, and if they are taught that the Catholic Church is "the enemy of gay men and women", well I am worried about the future, the protection of the Church under the Law. The Church teaches that it is homosexual acts that are sinful, of course, not that being homosexual is. MADRID,(LifeSiteNews.com) - The socialist government of Spain, while facing increasing domestic skepticism for its social re-engineering policies, has declared that "diversity" education will become a compulsory part of the schools curriculum starting in the new academic year. The new Education to Citizenship subject, set by the Ministry of Education, will include training in acceptance of the new realities of "gay marriage. The curriculum will teach children to accept "diverse family situations" and include training in "overcoming homophobic prejudice," and rejection of "discrimination" with regard to gender. In the parlance of the international pan-sexual movement, that encompasses radical feminism and homosexual identity politics, "gender" is an almost infinitely malleable social construct, having little to do with biology or reproduction. Groups at United Nations conferences have proposed such recognition for up to eleven "genders" including male homosexual, lesbian, bi-sexual, male-to-female "transgendered," asexual, hermaphrodite, and transvestite. Babette Francis the president and National & Overseas Coordinator of the Endeavour Forum, Australia's leading UN lobbyist in pro-life and family issues, told LifeSiteNews.com in 2004 that such programs can be expected to be put in place all over the world as part of the international movement to deconstruct the family. The Spanish curriculum includes lessons in "moral pluralism" the concept that there is more than one type of "morality" and that adhering to the traditional concept of moral absolutes is inherently "intolerant." The Professionals for Ethics Association has denounced the proposal for its "moralising and indoctrinating." Luis Carbonel, president of Concapa (National Confederation of Catholic Parents and Pupils) told Fides news agency, "Every responsible family has the obligation to refuse this school subject." Saying it is a "matter of freedom, to defend the basic and highest right to educate our children in keeping with our own principles," he denounced the government for attempting to usurp usurp the parents right to form "the consciences of their children." Benigno Blanco, president of the Spanish Family Forum wrote a letter to the European Parliament, saying that "the government of Spain is in conflict with the families, not with the Church." Since it came to power in a voter reaction to a series of terrorist bombings in March, 2004, the ruling Spanish Socialist Workers' Party has engaged in a program of social reconstruction in an attempt to move Spain away from its traditionally minded Christian roots. Within a year, the new government had legalised homosexual "marriage," and adoption of children by homosexual partners. It has legalized embryonic stem cell research and the use of abortifacient birth control, and has moved to increase access to abortion, as well as attempting to eliminate mandatory religious education in the schools. Ironically, it was fundamentalist Islamic terrorists, who despise the moral corruption of the West, that facilitated the rapid moral decline of Spain engineered by the Zapatero-led socialists. And so rejoice, Ann, that you were sterile and have not borne children; break forth into shouts, you who have not given birth. Rejoice, Joachim, because from your daughter a child is born for us, a son is given us, whose name is Messenger of great counsel and universal salvation, mighty God. For this child is God. AURONZO DI CADORE, Italy, (Zenit.org).- Benedict XVI says the beauty of Christianity is in relishing both the human and the divine. The Pope said this Tuesday during a question-and-answer session with 400 priests of the dioceses of Belluno-Feltre and Treviso, in the Church of St. Justina Martyr in Auronzo di Cadore, near Lorenzago di Cadore, where he is vacationing. One of the priests asked the Holy Father about enjoying human things, such as recreation. "I liked playing soccer more than going to Eucharistic adoration," the priest said, explaining that his superiors in the seminary scolded him for this. "Doesn't bringing man close to God, and God to man, happen in our humanity, even for us priests?" he asked the Pontiff. "I would be against choosing whether to play soccer or to study sacred Scripture or canon law. Let us do both," Benedict XVI responded. "We cannot always live in high meditation; maybe a saint at the highest levels of his earthly existence can do that, but normally we live with our feet on the ground and our eyes fixed on heaven. "Both are given to us by the Lord and therefore loving human things, loving the beauty of this earth, is not just very human, but also very Christian and quite Catholic." The Pope said that a "healthy and truly Catholic pastoral care" includes living in what he called the "et-et," Latin for "and-and." He explained that this should prompt us "to live humanity and the humanism of mankind, all the gifts that the Lord has given us, which we have developed and, at the same time, not to forget God, because in the end the great light comes from God and only from him comes the light that gives joy to the realities of the things that exist." "Therefore," the Holy Father said, "I would like to work for this great Catholic synthesis, for this 'et-et'; to be truly man -- that everyone according to their own gifts and their own charism loves the earth and the beautiful things the Lord has given us, but to also be grateful for the light of God that shines on the earth, that gives splendor and beauty to everything else." "Let us live in this Catholicity joyously. This would be my answer," Benedict XVI concluded, prompting applause from the priests present. These two photographs are on The New Liturgical Movement. From an aesthetic point of view the lower picture seems to bring a harmony to the visual confusion of the modern off-set liturgical setting. The first arrangement is bland and neutral, it could be anything, a municipal hall, a gymnasium, Christ is certainly not at its heart, in fact the flowers seem to have the most prominent place, as so often they do in this type of arrangement, whilst the other picture is quite different, here the crucifix dominates. 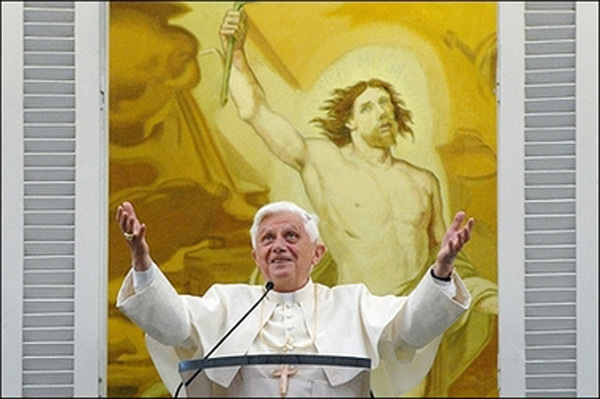 Pope Benedict spends much of his "Spirit of the Liturgy" talking about the importance of the centrality of the image of Christ crucified, on the altar. In a way one can say that throughout all his writings Benedict has always stressed the very centrality of Christ. I really do wonder if placing the crucifix (and the tabernacle) in a corner is a sign of the corruption of much of modern theology, a discomfort with a God who becomes flesh and dwells amongst us, and takes away our sin on the Cross. The first arrangement intends to focus on the priest who moves from chair to ambo to altar, in the traditional arrangement it is the crucifix that is important, even when the priest stands before it, he merely points to Christ. Important as he is, his importance is centred on his function, his service, not his personality. THE job of representing the pope in Burundi brings with it a fine colonial villa, but nobody would say Archbishop Paul Gallagher has an enviable post. In 2003 his predecessor, Archbishop Michael Courtney, died in a hail of bullets after mystery attackers ambushed his car. Whoever they were, the killers were clear about their target: the vehicle bore diplomatic plates and a Vatican flag, while the Irish cleric, in white cassock and purple skull cap, was known to all; so was his role in negotiating a peace accord, sealed a month earlier. The day of his death, December 29th, is now a fixture in Burundi's calendar. Thousands of miles away, on the frontier between Argentina and Chile, papal diplomacy is remembered in a different way. A mountain pass has been renamed after Cardinal Antonio Samorè, who before his death in 1983 helped settle a territorial dispute that could have led to war. In different ways, the Irish archbishop and the Italian cardinal represent the best of an ancient and often contentious quirk of the international scene: the fact that the Roman Catholic church, alone among faiths, is a diplomatic player. Over the past century—despite the march of secularism—the Vatican's role in world affairs has expanded. In 1890 a famous English Catholic, Cardinal Manning, said the Holy See's diplomatic activities were “a mere pageant”, a medieval relic. He would be amazed to find that in 2007 papal diplomacy is more active than ever. The real explosion came under John Paul II. When he was elected in 1978, the Holy See had full ties with 85 states. When he died, the figure was 174. Among states that dropped their misgivings were Margaret Thatcher's Britain, Ronald Reagan's America and Mikhail Gorbachev's Soviet Union. The Holy See now has full diplomatic relations with 176 states. Vietnam, China and Saudi Arabia are among the few without formal links. Recent years have also seen an expansion in the See's multilateral diplomacy. It sits in on the deliberations of 16 inter-governmental bodies, including the United Nations, the African Union and the Organisation of American States. The past few days I have been having a look at an early eighteenth century missal I found in a bookshop in Lewes a few months ago – yes I know it is not 1962 – but it is substantially the same. I had a visit from a priest of the Oxford Oratory yesterday. I suggested the present rite of the Mass seemed a little paired down by comparison, I mean the absence of the rather beautiful intercession of the saints, the rather glorious offertory prayers, the rather nice little gobbits of scripture, the prayers at the foot of the altar. I must say I rather like the idea of a one year cycle of scripture, I am a little apprehensive about the continual extension of Sunday readings into weekday ferias though it certainly gives prominence to Lord’s Day. Somehow the present three year Sunday Cycle seems to go over peoples heads, I am not sure that people are any better informed about the Word of God than they were previously. It was the pairing down of the liturgy itself that really strikes me, it seems so 1960’s, like Brutalist Architecture or “flush doors”. People used to cover panelled Victorian doors with hardboard so they were flush when I was very young, it was about utility and functionalism. Comparing the two Missals seems like comparing a period house in its original fixtures and fittings with one that had been modernised in the 1960. The problem is when you modernise something you have to do it every decade or so in order to stop it becoming passé. I suspect this is one of the reasons why many priests want to add some type of innovation in the Mass, like a musician adding decoration to a stark piece of music. There is a discomfort with what is presented in the Missal. Just the same as a in a modern minimalist Church people seem to want to put out flowers, pot plants and posters. Fr “B”, my visitor, suggested that the “Ordinary Form” of the Mass wasn’t really a 1960s innovation but something which sprang from the Bauhaus, in Germany and Futurism in Italy in the 1930s. He suggested that already by 1970 it was already out of date. Being in my teenage years in 1970, my friends were wearing embroidered Kaftans whilst the clergy were throwing out embroidered vestments, they were sitting in incense filled rooms whilst thuribles grew cold, chanting OM and meditating whilst Catholic worship became increasingly active, the Liturgy becoming almost a “machine” for worshipping in. It is too easy to blame the loss of a generation in the European Church on sociological trends. Maybe the Church and the Liturgy have some part to play in it, it would be nonsensical to claim, as some do it had nothing to do with "the changes". Imposing something from a decade that gave rise to Fascism and National Socialism on a generation that had so firmly rejected that would seem bound to cause ruptures and rejection. The 60s was a time of experts, who built functional “machines for living in”, the problem was that those for whom they were designed could not live in them, and they have now been swept away. If the more ancient usage is supposed to influence the post-Concilliar liturgy then “comparing and contrasting” is going to be one of the features of contemporary debate in the Church. I wouldn’t have said what I have above in public before the issue of the Summorum Pontificum, and maybe not seriously thought it but I suspect these are the questions the Pope wants us to ask and debate. The bishop of Hong Kong contradicts some of the claims made by sinologist Father Heyndrickx who suggests that the papal document encourages members of the underground Church to come out into the open, ask for recognition by civil authorities and concelebrate services with officials from the official Church. Hong Kong (AsiaNews) – It is not true that the letter Pope Benedict XVI wrote to Chinese Catholics says that bishops from the underground Church can concelebrate services with “all” bishops from the official Church. It is not correct to claim that the letter says that there are no more reasons for the existence of the underground Church or that “underground” bishops are urged to seek recognition of state authorities. It is not true that there are no more canonical sanctions against unlawfully ordained bishops. This in a nutshell is the reply Card Joseph Zen Ze-kiun, bishop of Hong Kong, delivered to a July 6 article by Fr Jeroom Heyndrickx, head of the Ferdinand Verbiest Foundation at Leuven’s Catholic University (Belgium), that appeared in the UCA News agency (the cardinal’s reply was published on July 18 and Father Heyndrickx’s counter-reply on the 20). If this were the case the Leuven scholar would lose his dignity, which is no something Father Heyndrickx has accepted. Instead he has reiterated his obedience to the Church and the Pope, not to Chinese leaders. He has only engaged the latter in a dialogue. At the centre of the controversy is Father Heyndrickx’s interpretation of the Pope’s letter. According to him the letter encourages members of the underground Church to come out into the open, ask for recognition by the civil authorities and concelebrate services with “all” the officials of the official Church. Cardinal Zen states that none of that is in the letter—there is especially nothing to suggest that bishops from the underground Church can concelebrate with “all” the bishops from the official Church. What the letter does say is that they can concelebrate only with those who are now in communion with the Holy Father. In this sense, the unity of the Eucharistic celebration is obviously important, but without a hierarchical communion it is only a lie. Similarly, underground bishops are not encouraged to apply for registration; they are only given the faculty or, rather, the heavy responsibility to make a "very difficult decision" for their individual dioceses as to whether they should seek recognition. For this reason, the underground Church still has its raison d’être since the Chinese government continues to oppress the Church. As for “canonical sanctions” the letter does focus on unity and dialogue, but it also explicitly mentions the “code of Canon Law (cf. c. 1382)” which “lays down grave sanctions both for the bishop who freely confers Episcopal ordination without an apostolic mandate and for the one who receives it”. from Rorate Caeli, I love this, so Benedictine. "Good evening! ", he said. "What an honor, Holiness...", some answered. A lady reminded him of her having sent a bouquet of stelle alpine [edelweiss]. "Yes, that is true, thank you! ", the Pope answered. "I sent you mushrooms," another one said. 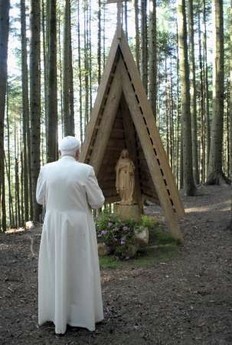 "Ah, yes, the mushrooms, I have eaten them," said Ratzinger. Then, approaching the journalists who expected him with open notepads, he shook their hands and asked them: "Why do you write? There is no news...". War is the result of men giving into Evil. From Cadore, a theatre of bloody battles during World War I, Benedict XVI launches an appeal for the world to “tenaciously pursue the rule of law, to refute with determination any recourse to arms and the temptation to apply old systems to new realities”. Lorenzago (AsiaNews) – “Never again war!”: from the mountains of Cadore, a place of great natural beauty that was transformed into a theatre of slaughter during the First World War, Benedict XVI launched an appeal that the path of peace and dialogue be chosen above conflict. The mountains around Lorenzago where the Pope is spending his vacation this year, still bear the scares of trenches and dig outs, built by the soldiers of the war. Recalling that “Great War” and the appeal launched by Benedict XVI, who in 1917 asked the world to stop the “senseless slaughter”, the Pope dedicated the words pronounced before the Angelus prayer in Piazza Calvi, of Lorenzago di Cadore, to the value of peace. After Mass about half the congegation came to venerate the relic and to ask her intercession. A little party after the party, outside the local, one of our Parish Centres. Check out the Justinian Code to find out more about the man. Also, be sure to check out Which Church Father Are You? quiz! Benedict XVI's long-awaited apostolic letter "Summorum Pontificum" on the use of the missal promulgated by John XXIII finally came out this month to a myriad of reactions and commentary. Some have been offering Masses of thanksgiving since July 7, the day the letter was released, some have been openly critical, and others think that really not much will change. In this document, the Holy Father decreed that any Roman Catholic priest is permitted to celebrate Tridentine Mass. Parishioners may request Masses celebrated in the "old" form. Last week, on the anniversary of the apostolic constitution "Quo Primum," issued July 14, 1570, as a papal bull by Pius V, it struck me how many of Rome's astounding churches were built after the codification of the Tridentine Mass. In this light, the return of the older form of the liturgy can help to understand and appreciate the grandeur of these churches. In the wake of the Council of Trent, 50 new churches were built in Rome. But the one that best represents the Tridentine age is the Gesù built from 1568-1584. Fruit of the collaboration between the newly-formed Jesuit order and Cardinal Alexander Farnese, the Gesù embodies St. Charles Borromeo's prescriptions for sacred edifices to showcase the new spirit of the liturgy. One of the primary concerns was acoustics, as the solemn Masses were completely sung and the sound of the chants was meant to fill the church. Trent's decision to retain Latin as the sole language of liturgical prayer underscored the universality of the Mass in a world of ever-expanding horizons. The rites in Asia, America, Europe and Africa used the same language as Rome and linked the most far-flung areas to the See of Peter. Sound also mattered because preaching became more important during this period. The Jesuits were instrumental in introducing greater emphasis on homilies and in the huge nave of the Gesù, there was space for hundreds to gather around the pulpit to hear their stirring preachers. Rood screens, which separated the presbytery from the nave, were removed after Trent, to allow the congregation to see the altar and liturgy more clearly. The altar was raised up on steps and the sanctuary defined by a low rail. The faithful were awed to see the majesty of the Mass; the priest, deacon and sub deacon lined up at the altar, the clouds of incense sweetening the air and the elaborate marble tabernacle nestled in the apse. For the Rome of 1585, the Gesù was a revolutionary structure while still respecting the tradition of the early Christian Church. The liturgy and the Church worked together to emphasize the re-presentation of the sacrifice of Christ. At the altar, placed against the wall, the celebrant recited the Eucharistic prayer in silence. From the nave, the faithful saw the priest's numerous gestures; 27 signs of the cross, five genuflections and most significantly, the raising of the Host amid incense and ringing bells. The altar was a block of stone, resembling a tomb or sepulcher, vividly reminding the flock of Christ's death and burial. In the Gesù, Giovanni Battista Gaulli frescoed the initials of the Latin translation of Holy Name of Jesus -- "IHS" -- in a burst of light above the altar. This glorious image helped the people to understand Christ's triumph over sin and death. With the same intensity of St. Ignatius' spiritual exercises, the Tridentine churches and liturgies invoked all the senses, exhorting the faithful to " love the Lord your God with all your heart and with all your soul and with all your mind and with all your strength" (Mark 12:30). The Catholic Church in England and Wales is under fire again this week for its failure to deal with allegations of child abuse. Five years ago, the Nolan Report forced the bishops to adopt extremely strict guidelines which – not to put too fine a point on it – treated an accused priest as guilty until proved innocent. A new body, the Catholic Office for the Protection of Children and Vulnerable Adults (Copca), was set up to implement those guidelines. Now an independent panel chaired by the former Tory health minister Baroness Cumberlege has reported that fears of false allegations are discouraging priests from working with children. The latest figures strongly suggest that most priests accused of abuse are, in fact, innocent. In 2006, police investigated 41 allegations, which resulted in one conviction. Yet, in the vast majority of cases, a priest is bundled out of his parish as soon as an accusation is made, and his chances of returning to his job, and restoring his good name, are slim even when it becomes obvious that no crime was ever committed. We do not want to go into the detail of this matter, except to say two things. First, that Copca has had an almost impossible task, damned if it did and damned if it didn’t; it has certainly treated some priests unfairly, but the Nolan recommendations are partly to blame for that. Second, that the Church must find some way of combining stringent child protection procedures with a presumption of innocence enshrined in Canon Law. We need a proper debate about how to distinguish malicious and patently false allegations from ones that require criminal charges. The sacrifice of an innocent priest’s good name is a terrible thing. British Prime Minister Gordon Brown's office was caught up in a row on Friday over plans for a large mosque in London that have drawn vitriolic opposition from far-right campaigners. A petition posted on the prime minister's Web site, www.number-10.gov.uk, calling for the mosque's construction to be blocked, attracted more than 275,000 signatures before the window to sign up closed late on Wednesday. While the number of signatories suggests strong opposition, the petition has drawn accusations of racism and Islamophobia from civil liberties groups and Muslim Web sites. The mosque's backers also point out the petition exaggerates the facts. At a time of heightened tension after a series of Islamist attacks, the debate risks inciting deeper social unrest in Britain, which has a 1.7 million-strong Muslim community. The online petition has turned the proposal to build a site of religious worship on empty land into an issue drawing in the prime minister's office, the mayor of London and the 2012 Olympics. Responding to the furore, the government said it did not endorse the language used in the petition. The petition was started by Jill Barham, a campaigner linked in the media to a far-right blog called English Rose. Attempts to reach Barham for comment were not successful. In the petition, Barham states: "We the Christian population of this great country England would like the proposed plan to build a Mega Mosque in East London scrapped." But even before that signature was found, the petition had drawn sharp criticism. One criticism was that it played up facts, calling the mosque a "mega" structure that would cost 100 million pounds ($200 mln). Those behind the mosque, a Muslim group called Tablighi Jamaat, which has 75 million members and calls itself a missionary movement, say it will cost 50-75 million pounds. They also dismiss suggestions it will house 40,000 people, saying it is set to hold 12,000 -- which would still make it the largest site of worship for any religion in the United Kingdom. "Neither the source of funding, nor the size of the proposed mosque has been reported accurately," said a spokesman for Tablighi Jamaat. "The group is saddened that so many people have been influenced by false information." London's mayor, Ken Livingstone, issued a statement this week denouncing the false reports, including one saying he would fund the mosque. He said they could damage community relations. "The particularly vicious nature of the campaign against a possible Muslim place of worship in east London should be condemned by all of those who support...freedom of religion," he said. A statement on the prime minister's Web site said the government believed discussion of such controversial issues should take place "in a manner that respects the views of all." While Tablighi Jamaat is largely maintaining a low profile, the debate shows scarce sign of going away. One line of attack from opponents is that the mosque is tied to the London 2012 Olympics. In fact Tablighi Jamaat bought the land for the mosque in 1996, long before the games were awarded. But if permission to build is granted, it would open in 2012. Pope Benedict XVI on holiday at Mirabello castle in Lorenzago di Cadore, northern Italy. I read in the Catholic Herald that one of the policemen guarding him struck by lightening, he was completely uninjured. The holy Father also met a 96 year old parish priest, the oldest active priest in Italy. Many Americans seem to want the Pope to do something dissenting Bishops, normally something very unpleasant, there is a very good article by Fr. Robert Johansen in the The Rock, h/t to Curt Jester. The little Church of S. Gregorio dei Muratori with its odd rickety candlesticks is just along the road from the Domus Paulus VI where I was staying in Rome. I went along just out of curiosity as it is the Society of St Peter's Roman Church, thinking I might find the text of Summorum Pontificum. Mass had already begun, it was celebrated by a young French priest with rather beautiful Latin, I was by far the oldest person in the congregation, the tiny Church was only half full, but what struck me was that all of the congregation were half my age, a few men but mostly young women, one or two very elegant, most dressed simply in mantillas. It was the youthfulness that impressed me, I popped into another Church a few streets away, far more in the congregation but there I was more or less the youngest, except for a few guitar players who looked very bored when they were not strumming. Such an interesting contrast.